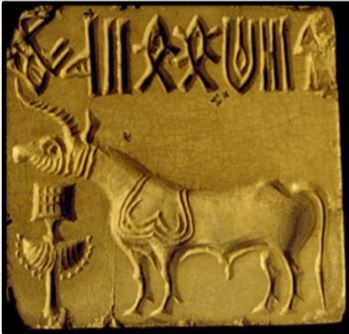 India Indus Valley Civilization - HISTORY'S HISTORIESYou are history. We are the future. 4. Technology: How does technology affect peoples' lives? Ancient India was a place of singular beauty and deep mystery. Ancient India was a place that witnessed the birth of two great world religions and placed great value on education. Due to its emphasis on education, ancient India was the source of numerous scientific and medical advancements. The ancient In﻿dians, however, also lived during a time when unpredictable weather and nomadic invaders posed a constant threat to their way of life, their beliefs, and their future. Because of it's rich history and unique geographical position at the crossroads of eastern and western culture, India remains unique to this day. Review: What are the 5 traits of civilization? The Discovery of Harappa: The Indus Valley civilization, also known as the Harappan civilization, and sometimes the Indus-Saraswati civilization, is one of the world's oldest societies. While it is one of the great civilizations of antiquity, it is also one about which scientists and historians know very little. Certainly, less is known about Harappan civilization than many of the other civilizations that existed at the same time, civilizations such as Mesopotamia and ancient Egypt. What we do know, however, is pretty fascinating! Over 4,500 years ago, in the Indus Valley, where Pakistan is today, people built huge, planned cities, with straight streets laid out in a grid. 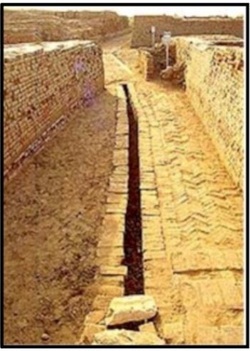 Cities in the Indus Valley had a network of underground sewers to carry waste out of town. People who lived in these cities had brick homes with private toilets and baths! Kids played with toys. Men and women each enjoyed the fashions of their times. Women even wore lipstick! How do we know this? Huge earth mounds dot the Indus Valley. In 1922, archaeologists found something exciting beneath these mounds! They found the remains of an ancient city called Harappa. They found another city, located 400 miles southwest of Harappa, called Mohenjo-Daro, which means "mound of the dead" in Sanskrit. Historians now know that by 2500 BCE, nearly 5000 years ago, the Indus and Saraswati valleys contained hundreds of cities, all sharing the same design and arranged in the same way. The architects of cities like Harappa and Mohenjo-Daro surrounded these cities with heavy brick protective walls. Inside the walls, city streets crossed each other in a neat grid with square corners. Along the city streets were homes, shops, and even factories. The cities also had large public buildings that may have been used for religious or government functions. Brain Box: What do straight streets tell us about Harappan builders? A Wide-Spread & Prosperous Culture: While looking for more cities, archaeologists found something interesting. They found a dried, buried riverbed that parallels the Indus River. As they followed this dried and forgotten riverbed, they found more and more ancient towns and cities. Since the initial discovery of Harappa, over 1400 ancient towns from the Harappan civilization have been discovered, some along the Indus River and even more along the forgotten ancient riverbed of the Saraswati! Top, an artist's depiction of what the port city, Lothal, looked like. Below, Lothal today. Port cities like Lothal connected the Indus Valley to distant trading partners. The vast number of cities and towns that have been uncovered indicate that people across a wide region shared this advanced Harappan culture. These Harappan cities are spread across an area about 500,000 square miles in size. That is about twice as big as the state of Texas. Despite the wide spread of Harappan culture, cities throughout the Indus Valley all shared a common design and, therefore, looked remarkably similar to one another. Even the bricks used in buildings across the region are all manufactured using the same dimensions, as if there were a common system of weights and measures. Across the region, archaeologists have discovered other common items in towns spread far apart. Across great distances, it seems the Harappans made similar bronze statues and clay toys. Brain Box: With so many similar items spread across a wide region, what can we guess about Harappan culture? These artifacts show that the people who lived in the Indus Valley could afford more than just basic necessities. In fact, because agriculture and trade made them wealthy, they could. Archaeologists have found seals from the Indus Valley, like those shown to the right, as far away as Mesopotamia. Indians traded timber, ivory, and beads. Mesopotamians exchanged silver, tin, and wool. Because of the similarities spread across a wide area, many Historians believe that Harappan culture was ruled by strong Kings or Priests. For decades, scientists have believed the statue whose picture appears above represented a priest or king. Now, however, some archaeologists readily admit that they just can't be sure. Certainly, we can agree that the Indus Civilization was large enough to be called an empire. As such, it would have benefited from strong leadership. Harappan Culture: Over 4,000 years ago, the Indus Valley cities of Harappa and Mohenjo-Daro were two busy places with populations of about 35,000 people each. In these cities and in each of the Indus Valley towns and cities, life flourished! Brain Box: Why do you think the Harappan people built along the sides of rivers? Homes: Harappan houses were one or two stories high and were made of baked brick. They had flat roofs and, as with so many other things throughout the Indus Valley, they were just about identical. Each was built around a courtyard and had windows that overlooked the courtyard. The outside walls most often had no windows. Each home had its own private drinking well and its own private bathroom. Clay pipes led from the bathrooms to sewers located under the streets. These sewers drained into nearby rivers and streams. This was a very advanced civilization! Harappan Fashion: All that we know today about the clothing and accessories that Indus people wore comes from clay figures and sculptures, as well as the jewelry left behind. With the exception of small fragments of cotton, wool, and silk, little fabric remains. From their art, however, we can learn quite a lot about how the Harappan people dressed. They wore elaborate turbans and hats adorned with feathers and jewels. Both men and women dressed in colorful robes and wore jewelry. The Priest-King, below right, wears an elaborately embroidered robe and a headband with a circular pendant. The figurine on the far left depicts a woman wearing a fan shaped hat with flowers, a choker, an elaborate belt, and a short skirt. Harappan jewelry included necklaces, head ornaments, belts, and bangles (bracelets). Jewelry was made from gold and silver, with beads made from terra cotta, stones such as lapis lazuli and turquoise, shells, and even seeds. Indus people loved their bangles and beads, just as they do today. The famous archaeological find named "The Dancing Girl of Mohenjo Daro" shown below second from left depicts a young woman wearing a necklace with three pendants and multiple bangles, a style that, as you can see, remains popular in India today. ﻿Brain Box: ﻿What can we learn from things like the Great Bath and Harappan toys? Entertainment: The statue of the "Dancing Girl" tells us that the Indus people enjoyed dance and had great skill working with metals. In the ancient city of Mohenjo-Daro, scientists have found the remains of a large central pool, with steps leading down at both ends. The bricks that make up the structure were coated with bitumen, a natural tar, to make the Great Bath water tight. Though no drains have been found, there is a well structure nearby that may have provided the water for the Bath. This could have been a public swimming pool. However, most scholars believe that the Great Bath was used for purification rituals as a part of religious ceremonies. Around this large central pool were smaller rooms that might have been dressing rooms, and smaller pools that might have been private baths. Food: The Harappan people were very good farmers. They grew barley, peas, melons, wheat, and dates. A typical Harappan dinner might have been warm tasty wheat bread served with cooked barley or rice. Farmers also raised cotton and kept herds of sheep, pigs, zebus (a kind of cow), and water buffalo. Fish were caught in the river with fishhooks! Toys: People of the Indus valley seem to have truly enjoyed toys, and archaeologists have uncovered numerous examples that point to a sophistication in design unmatched in the ancient world. The toys found included small carts, whistles shaped like birds, and toy monkeys, which could slide down a string! Art: This ancient civilization must have had marvelous craftsmen, skilled in pottery, weaving, and metalworking. 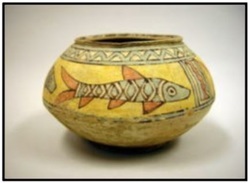 The pottery that has been found is of very high quality, with unusually beautiful designs. Several small figures of animals, such as monkeys, have been found. These small figures could be objects of art or toys. There are also small statues of what are thought to be female gods. So far, scientists have found no large statues. They have found bowls made of bronze and silver, and many beads and ornaments. Transportation: The people used camels, oxen and elephants to travel over land. They had carts with wooden wheels. They had ships, with one mast, probably used to sail around the Arabian Sea. Seals with a pictographic script, which has not yet been deciphered, were found at the Indus Valley sites. Similar seals were found in Mesopotamia, which seems to indicate possible trade between these two civilizations. Himalayan Mountains: One of the advantages of the Indus Valley civilization was the Himalayan Mountains. The Himalayas acted as a natural barrier, offering protection from other people in the ancient world. Water ran down from the Himalayas and fed the Indus River, keeping it full of clean, fresh water. The Himalayas provided important timber, and minerals like gold, silver, tin, and semi-precious metals. Cedar was used for building and for coffins. The Riddle of the Indus: What does it take to build a city with straight streets and well-designed sewers? It takes smart engineers and a lot of planning! These well organized cities suggest a well-organized government and probably a well-developed social life. What is amazing is that it appears the Harappan cities did not develop slowly, which suggests that whoever built these cities learned to do so in another place. As the Indus flooded, cities were rebuilt on top of each other. Archaeologists have discovered several different cities, one built over the other, each built a little less skillfully, with the most skillful one on the bottom. It would appear that builders grew less able or less interested in perfection over time. Still, each city is a marvel, and each was greatly advanced for its time. So far, scientists have found no wall carvings or tomb paintings to tell us about their life. We do know they had a written language, but only a few sentences, on pottery and amulets, have been found. Although scientists cannot yet read the language, they are beginning to believe these people had a common language! Scientists have also found artifacts at different sites (towns) with the same or similar picture of a unicorn on them. India Today suggested humorously that perhaps it was a logo — like Pepsi and Coke, only this one was a Unicorn! These people lived about the same time in history as the ancient Mesopotamians and the ancient Egyptians and scientists remain very curious about them. Did these ancient civilizations know each other in ancient times? The Ancient Mesopotamians, whose cuneiform language scholars can read, talk about a special place with an aquatic culture, where water and bathing played a central role. The ancient Mesopotamians might have been talking about the people of the Indus Valley. As scientists continue to unravel the riddle of the Indus, we may find we will have to rewrite history! Was it the ancient Mesopotamians who first invented the sailboat, or was it perhaps the people of Harappan era India? One mystery is why the people who lived in these marvelous cities disappeared around 1500 BCE. Perhaps they ran out of wood to hold back flooding, or perhaps their soil gave out and would no longer support growing crops. There is some evidence that earthquakes hit the area around this time. Such a seismic event might have caused the rivers to change course altering the lives of the people living in the Indus Valley. Where did these people come from, and where did they go? It’s a fascinating riddle. It will be interesting to see what archaeologists “dig up” next!